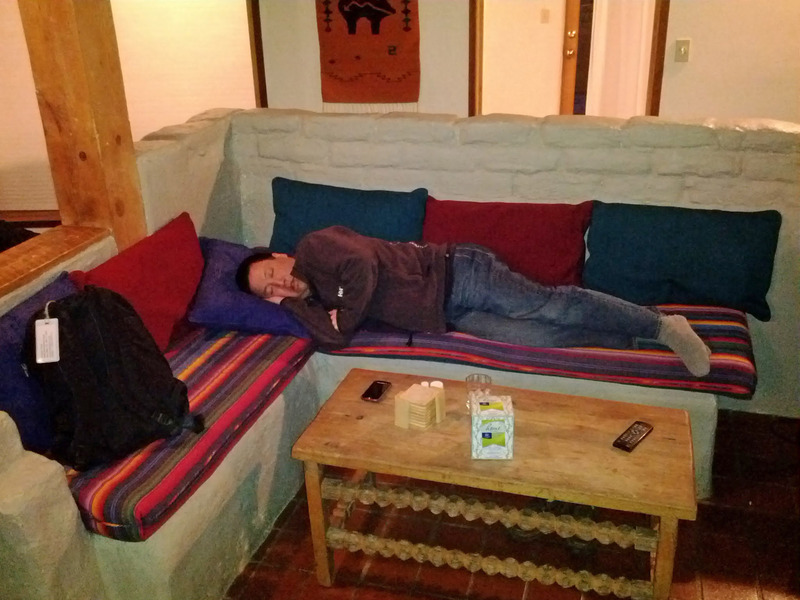 On 3/2/2011 (Fri night) - 3/6/11 (Monday morning) several of us met in Taos, New Mexico to go skiing. 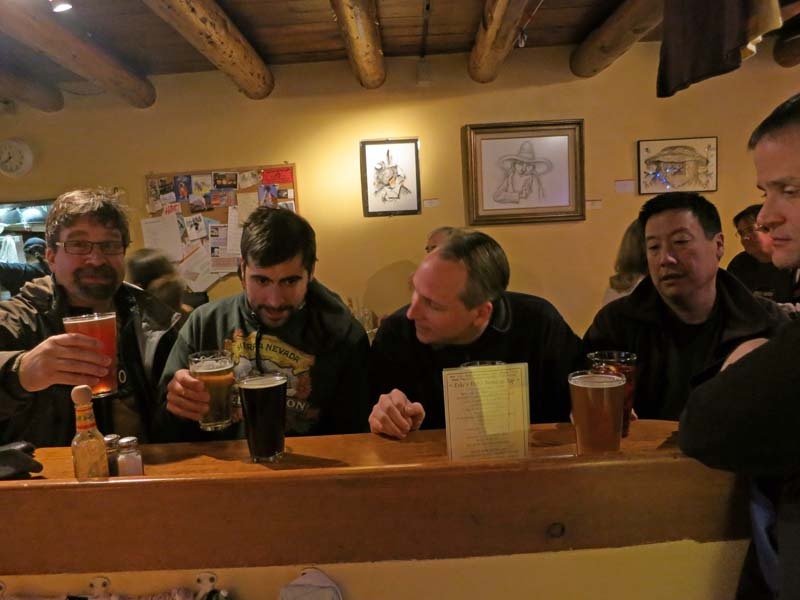 Here is who showed up: Me (Brian Wilson), Mike Chow, Brady Nilsen, Brian Wohletz, Karl Dohan, and Dave Washburn. Below are some pictures from the trip. Click on any picture to get a HUGE version of that photo. 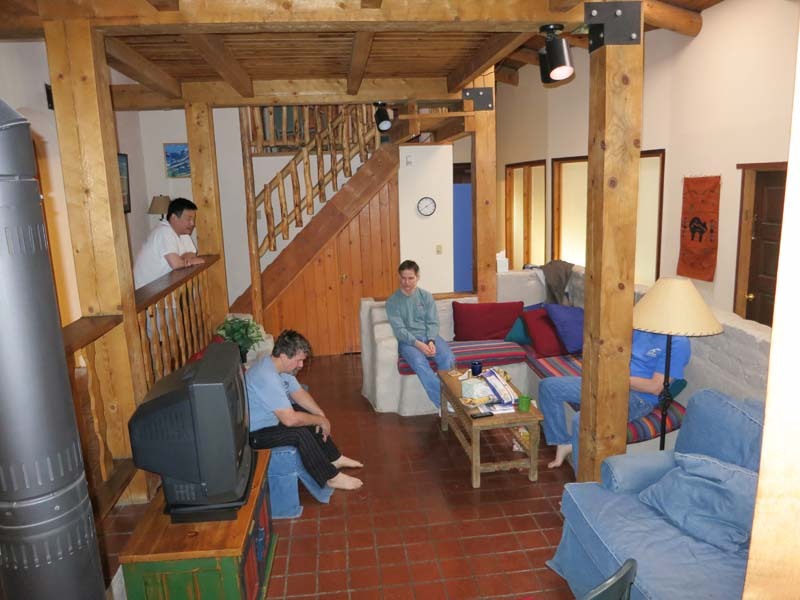 This trip (with this group of friends) is an annual trip we have taken for 15 years. Each year we decide a new location and all meet there. Here is the list of locations and the dates we skied there. 12/20/97 - Crested Butte, Telluride, Vail, and Aspen, Colorado road trip. Ok, on to the pictures! 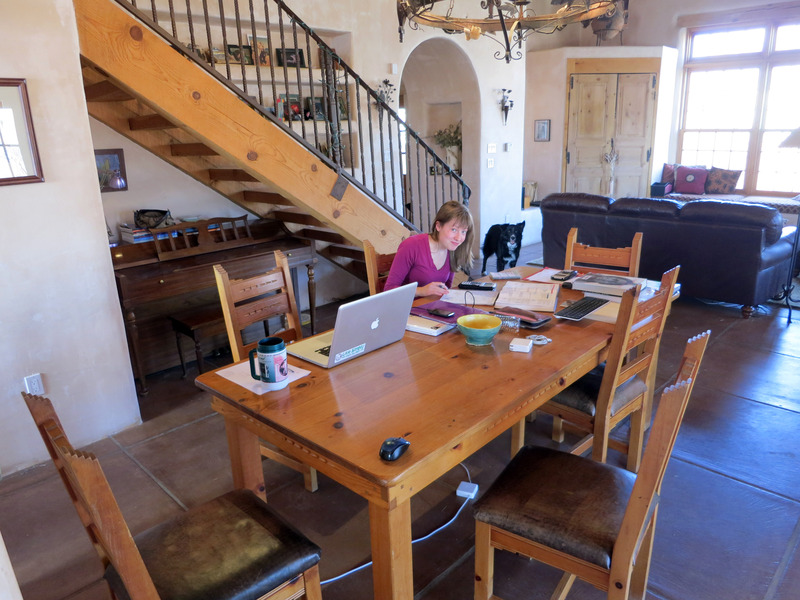 We all fly from all over to meet in Albuquerque, New Mexico. 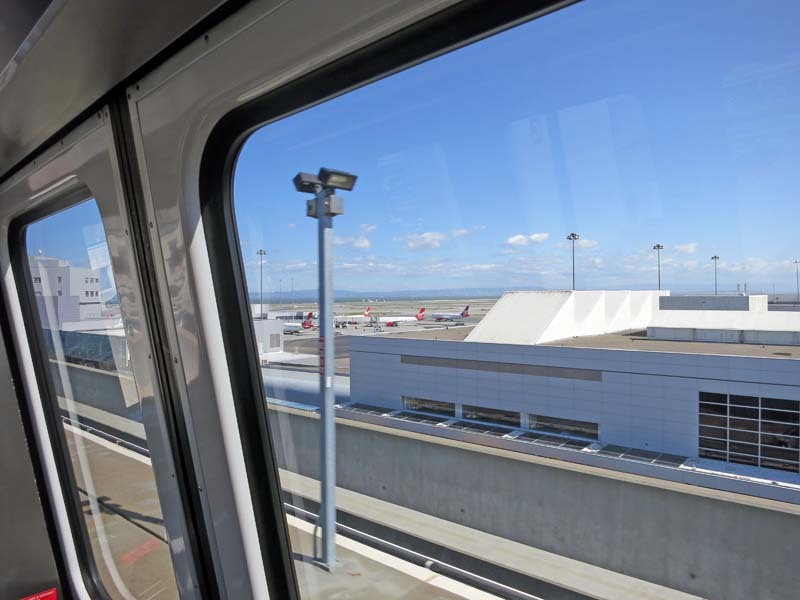 Here I am riding the "AirTrain" in San Francisco Airport (SFO) to get to the terminal. Very few people think airlines and airports are "well run businesses". 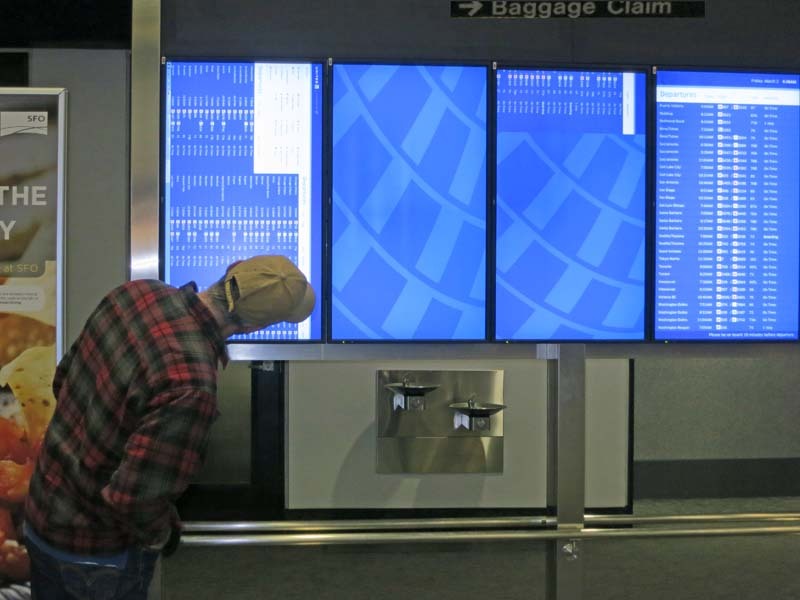 This morning in SFO the list of flights was rotated 90 degrees on the monitors, and not a single employee of the airport thought that was unusual or wrong or thought to fix it. 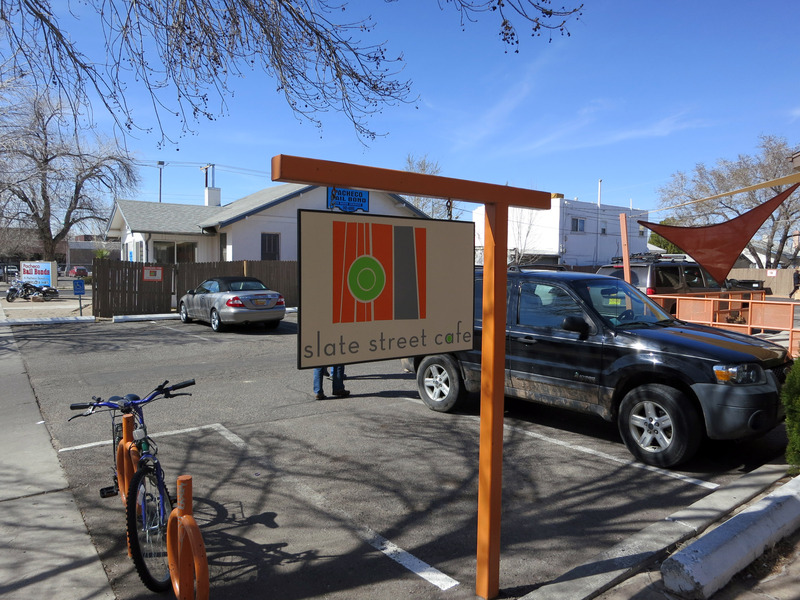 In Albuquerque, New Mexico, here I am driving "Slayer" (our SUV) with Mike Chow in the back and Dave Washburn newly addicted to "Plants vs Zombies" on the iPad in back. Brian Wohletz is my co-pilot (not seen). 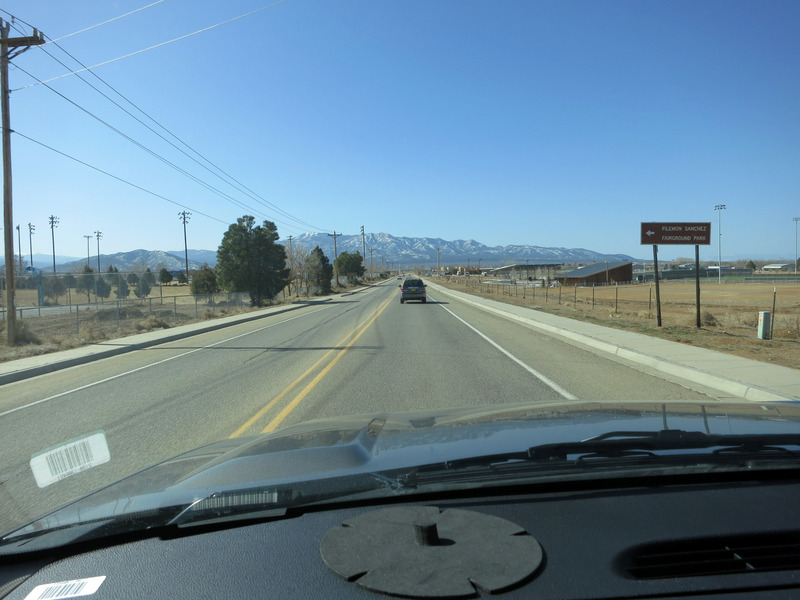 We drive from Albuquerque, New Mexico to Taos, New Mexico, which is about 2.5 hours at maximum speed. 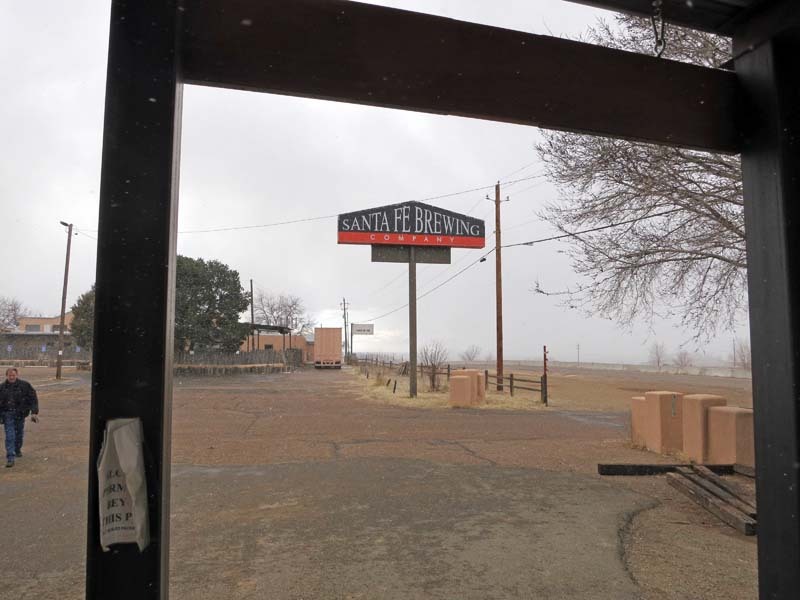 But we stopped off at the Santa Fe Brewing Company for a few growlers. 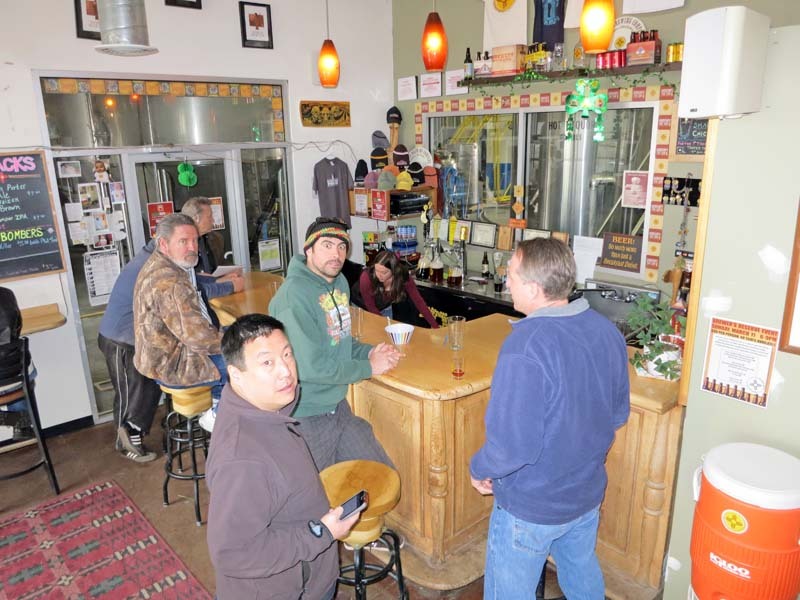 Inside the Santa Fe Brewing Company lobby, below is Mike, Dave (in Green) and Brian Wohletz. The Santa Fe Brewing Company menu. 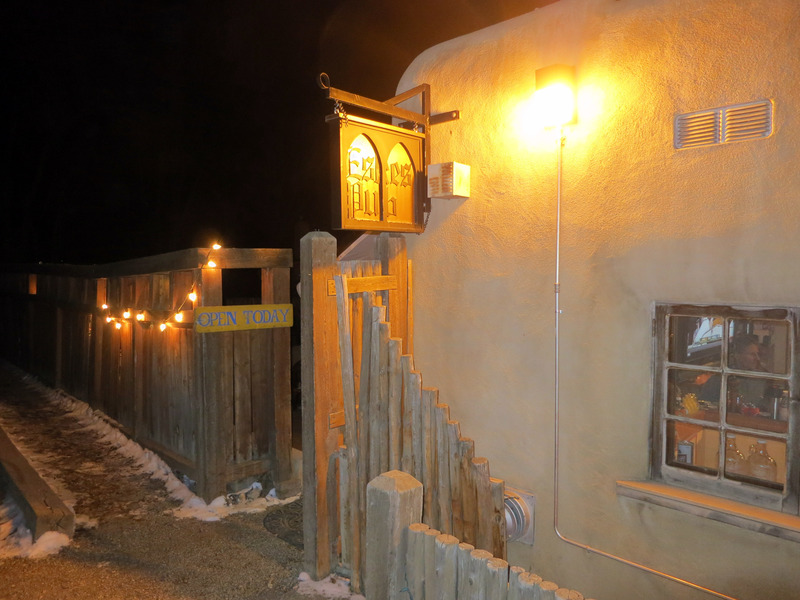 At night for dinner we went out to Taos Out Back pizza, here we are waiting for our pizza. The waitresses here were a little baked, like the pizza. Below from left to right is Karl Dohan, Brian Wohletz, Dave Washburn, Brady Nilsen, and I'm taking the photo. Chow didn't feel well so he stayed back at the condo. 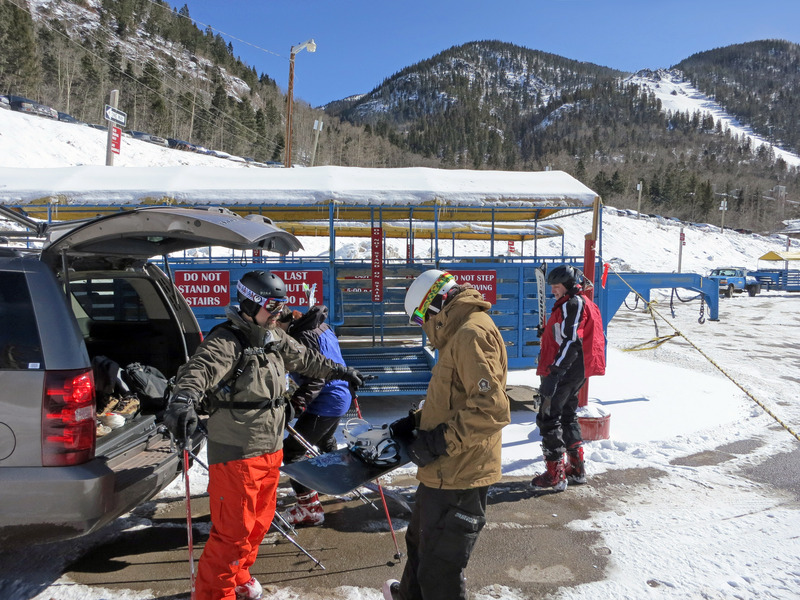 Saturday, March 3rd, parking lot of Taos Ski Valley. It's a beautiful day, Mike Chow stayed in bed. We think he took a nap in each of our beds while we were out, because later all of us got sick except Brady, who showed up with his own head cold. 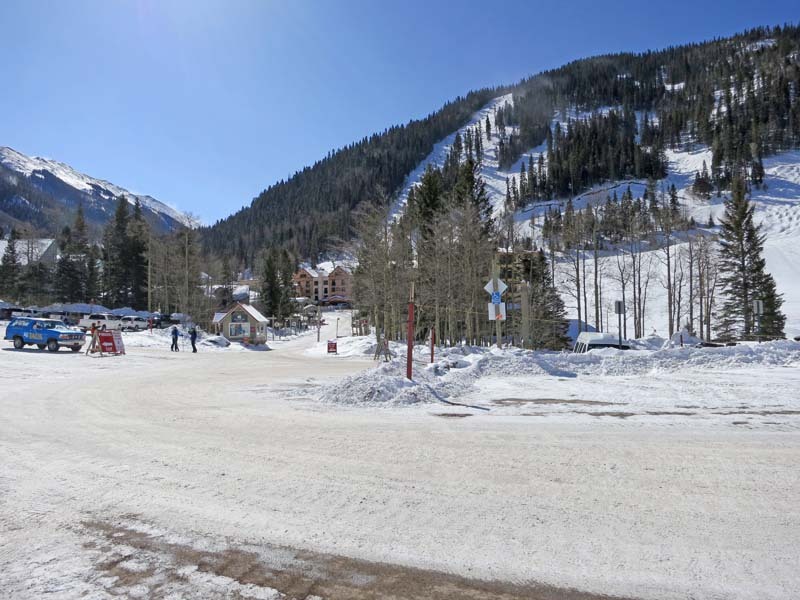 The parking lot at Taos. Our motley crew of skiers about to take our first chair lift up. 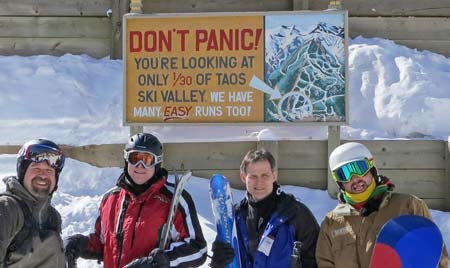 This is the famous "Don't Panic - You're Looking At Only 1/30 of Taos Ski Valley" sign. At the summit of Taos, New Mexico, there is a sign for the less intelligent amongst us to "DO NOT TOUCH EXPLOSIVES". Good advice. 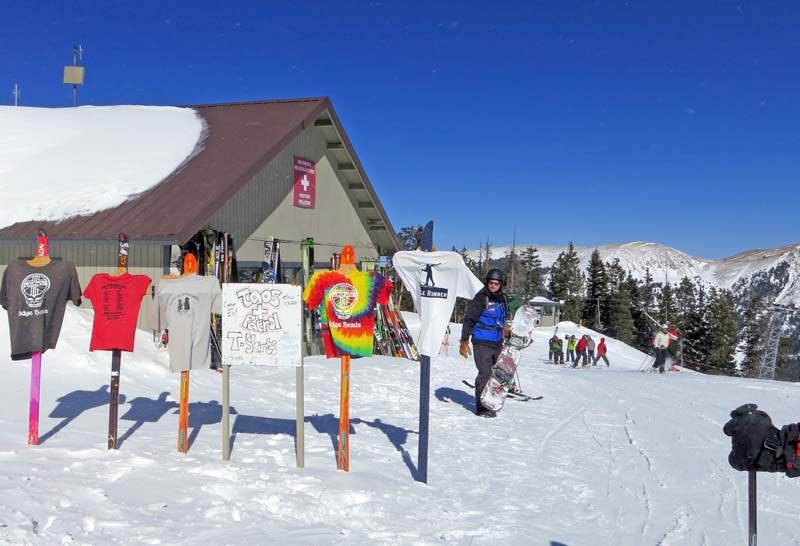 Also at the summit of Taos you can buy a "Ridge Head" T-shirt, some of the selection is seen below. 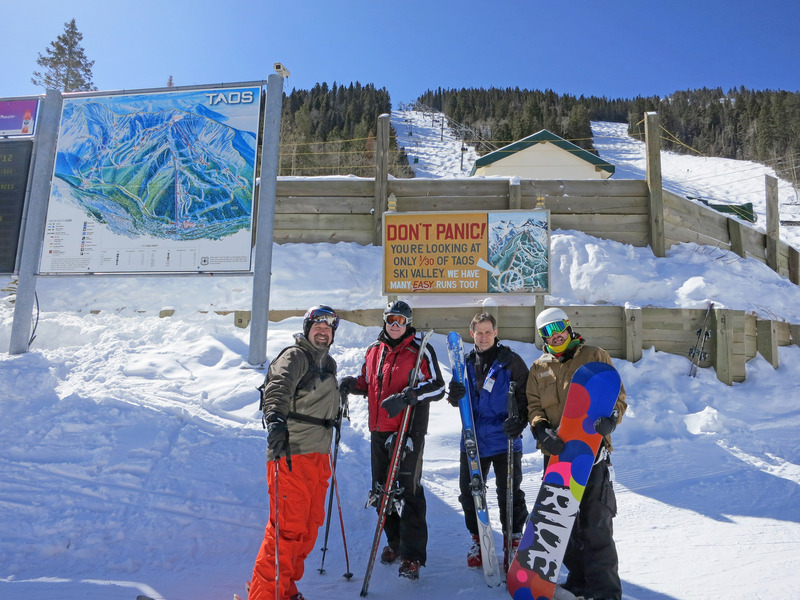 The ridges are famous hikes above the top lifts at Taos, double black diamond runs. 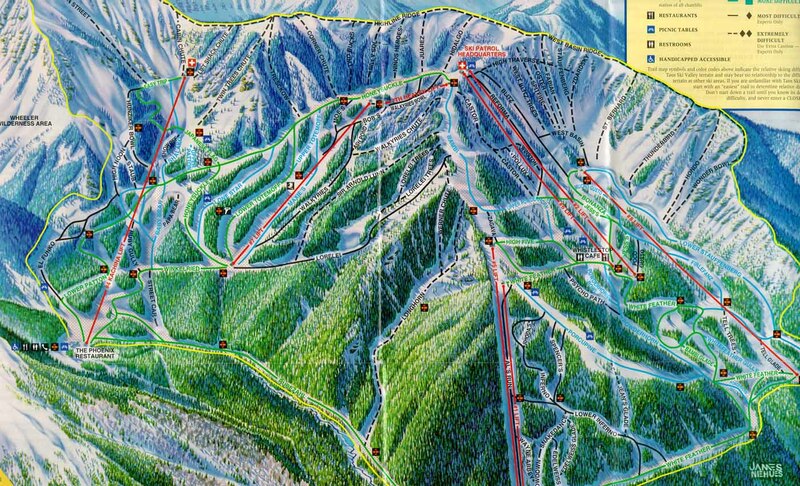 Click here for a lift map of Taos to see the double black ridge runs. 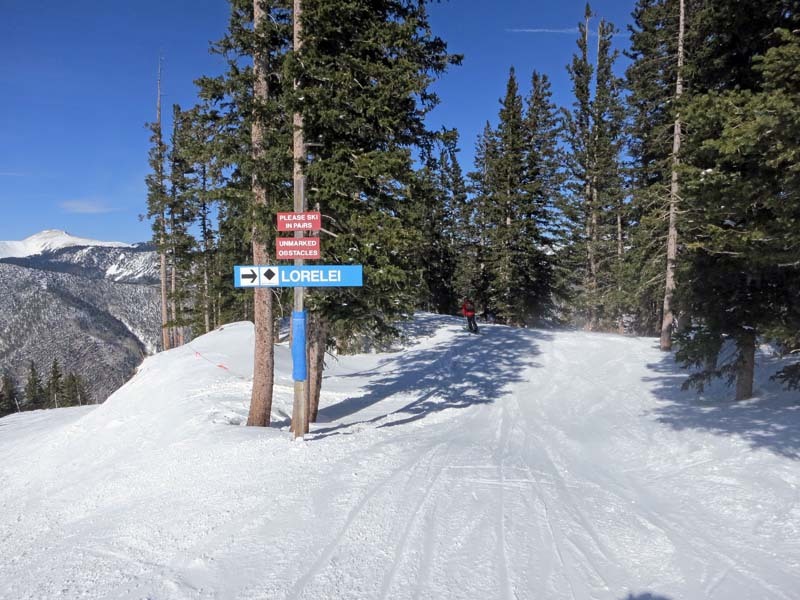 One of the runs at Taos is "Lorelei", below we enter it. I like how it says "Please Ski In Pairs". Brady below me in the Lorelei trees. 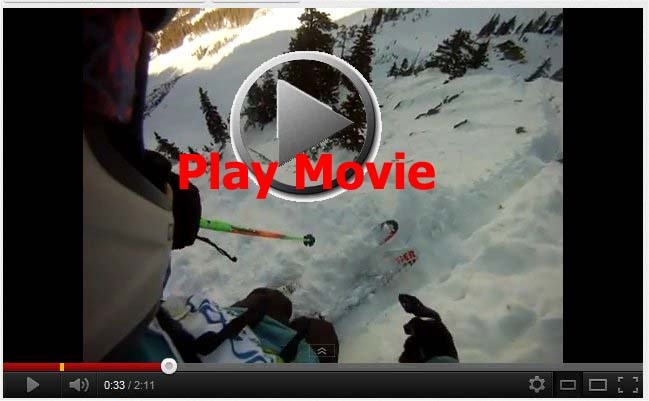 Below is a silly movie down some intermediate slopes. I'm holding the camera in one hand, so the skiing isn't all that great or impressive. 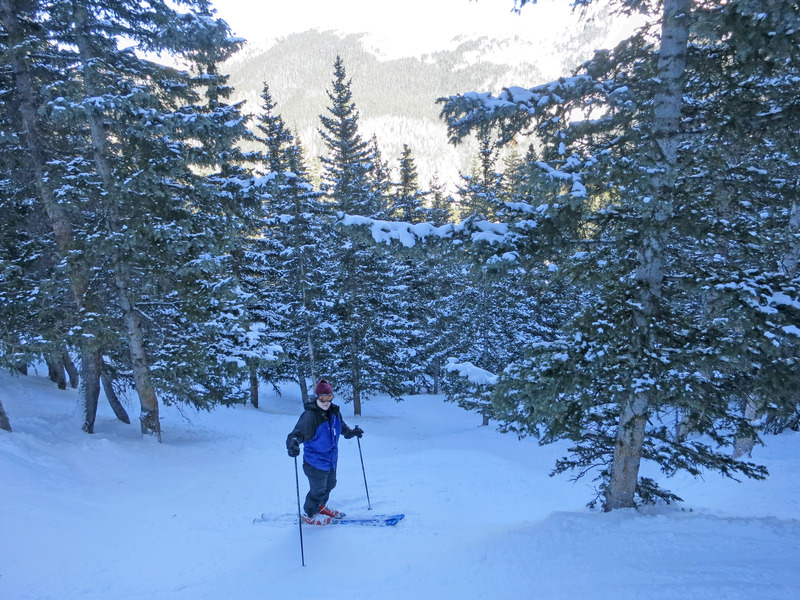 :-) It's about the sunshine and fun, not extreme skiing. Click here for a very high quality QuickTime movie (will probably not work on Microsoft Windows computers). 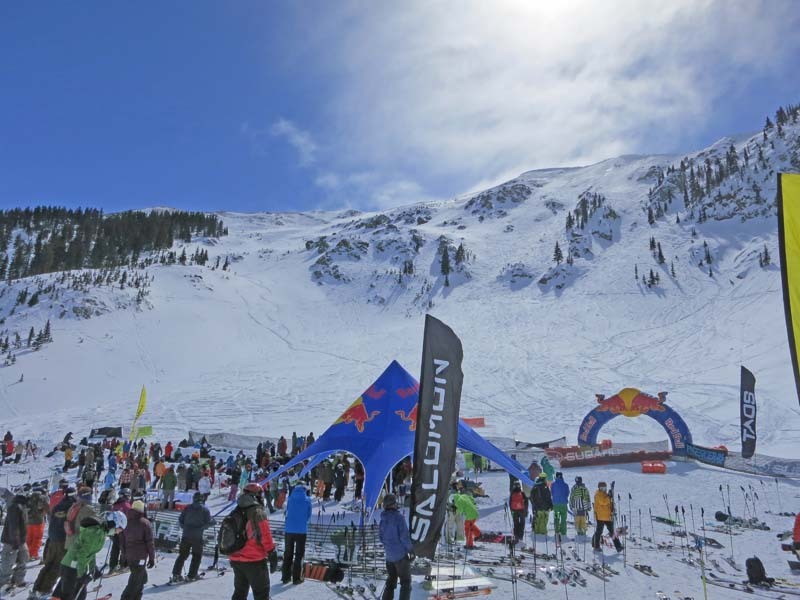 The day we were up skiing was also the 2012 Taos Extreme Freeride Championships. The skiers come from the very top ridge you see through the cliffs and finish here. 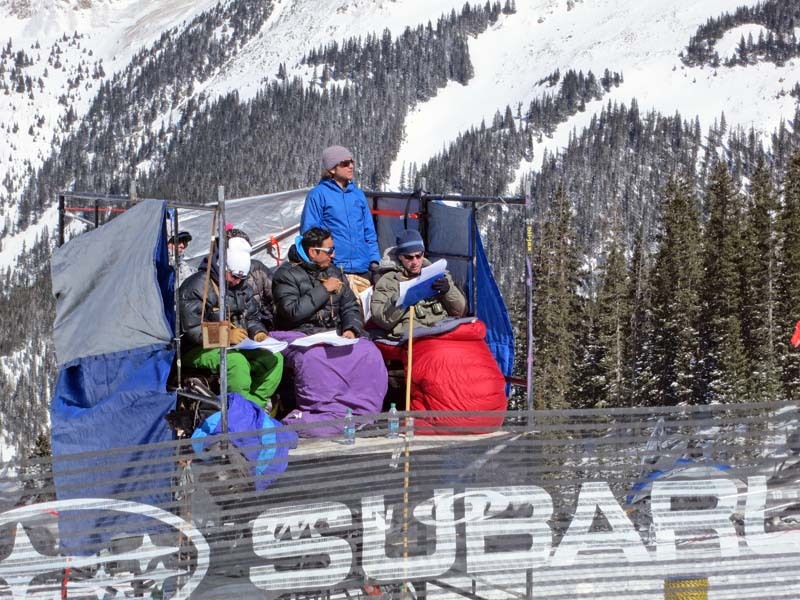 The judges booth for the 2012 Taos Extreme Freeride Championships. The following is NOT a video from our group, it is a YouTube video taken from Matt Potter's helmet cam (one of the competitors). 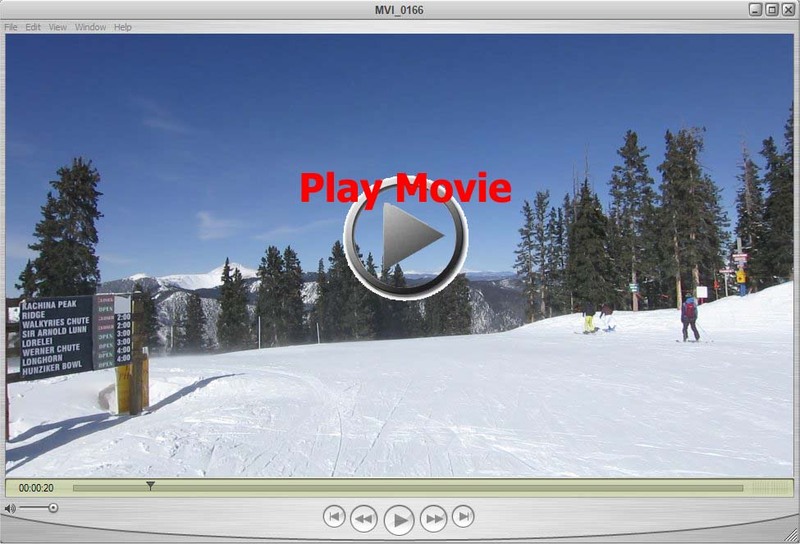 It shows what it looks like to ski in the competition. I just found this online. 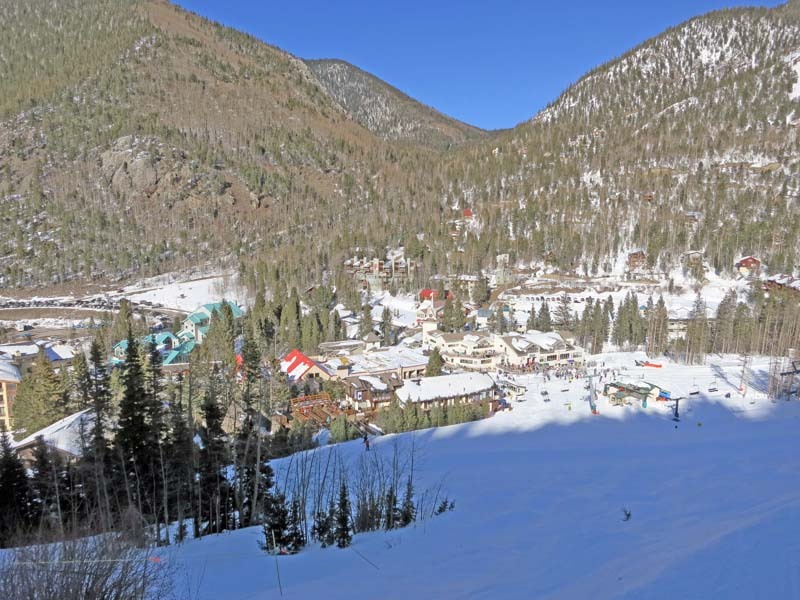 At the end of the day, here the shadows start to stretch over the Taos base lodge. 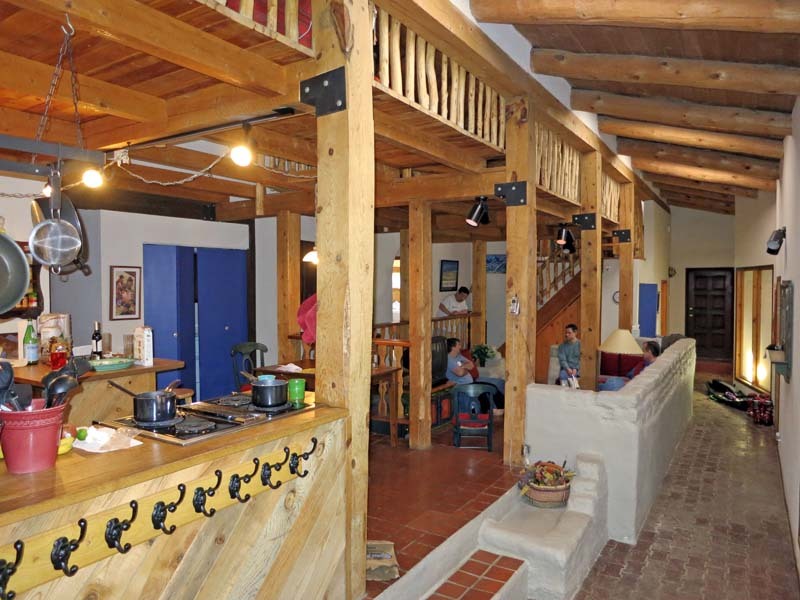 A picture of the base lodge at Taos. 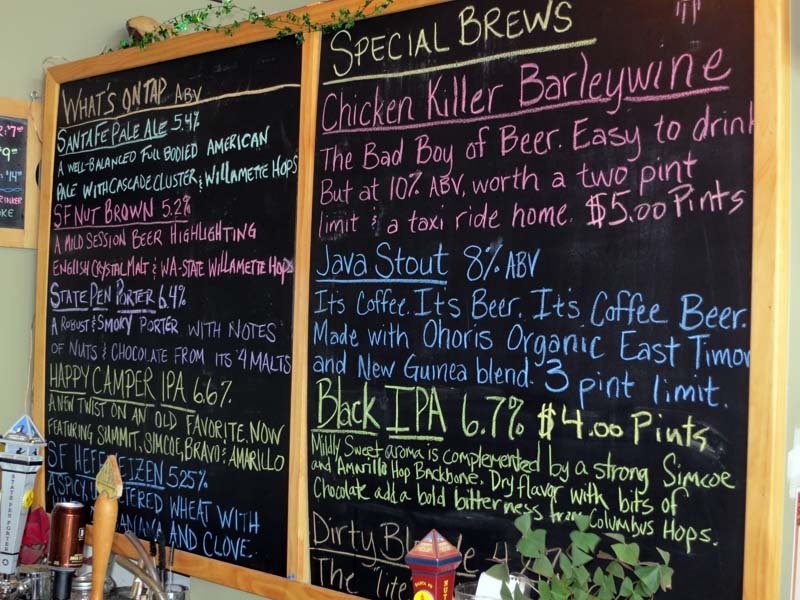 That night we go out to dinner at Eske's Brew Pub and Eatery. 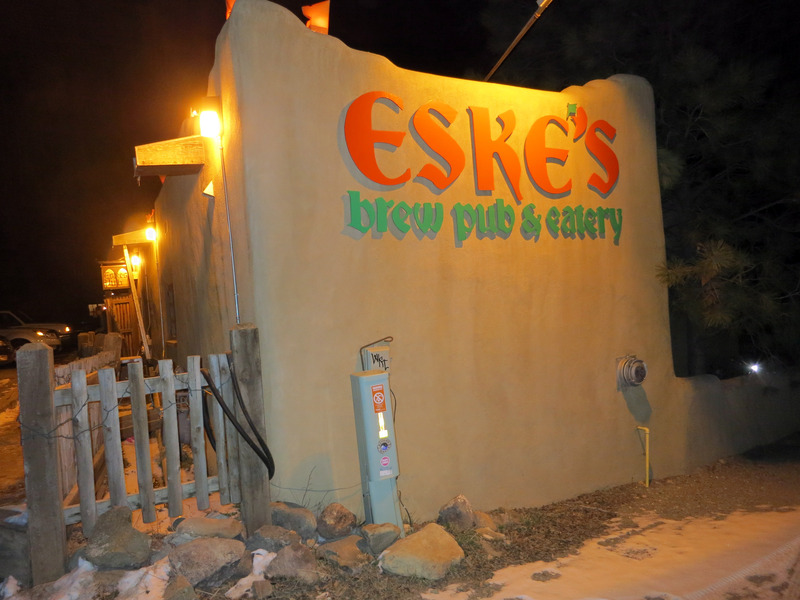 The front door Eske's Brew Pub in Taos New Mexico. 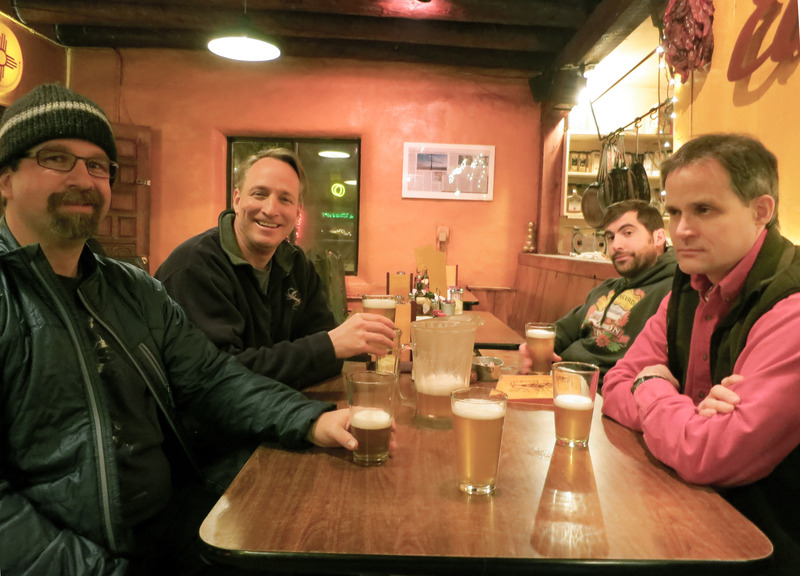 From left to right: Karl, Dave, Brian Wohletz, Mike (still not feeling well) and Brady. The next day (Sunday) I was sick in bed (thanks Mike!) 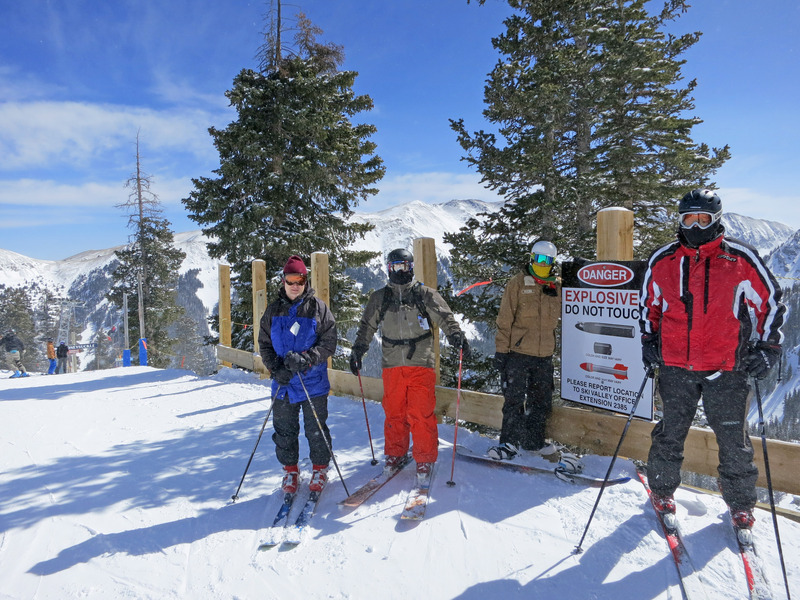 but the rest of the group hiked the ridge at Taos up to the Juarez double black diamond ski run at Taos. 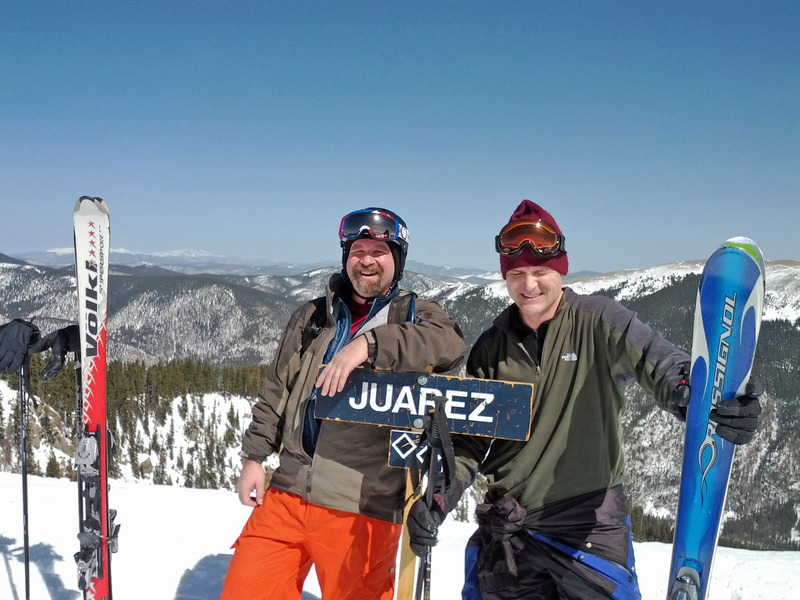 Below are Karl and Brady on the ridge at Taos. 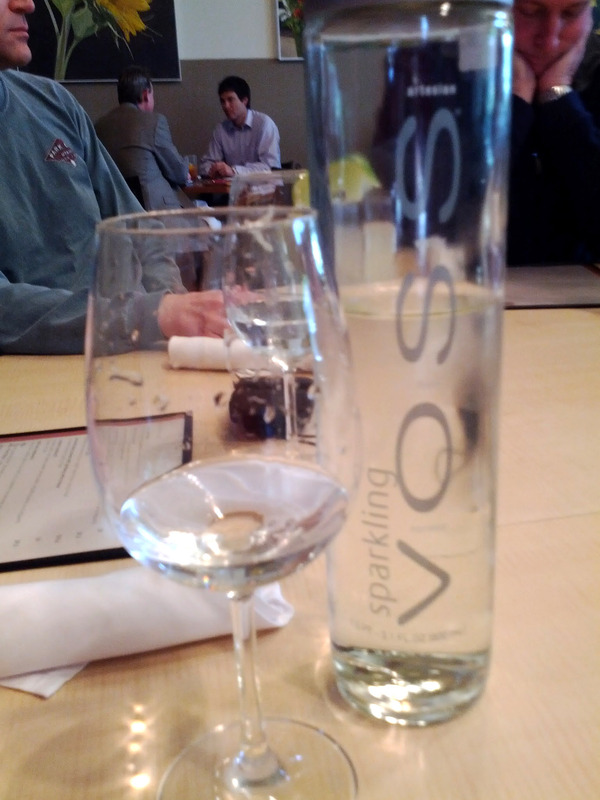 Picture from Karl's phone, probably taken by Brian Wohletz? 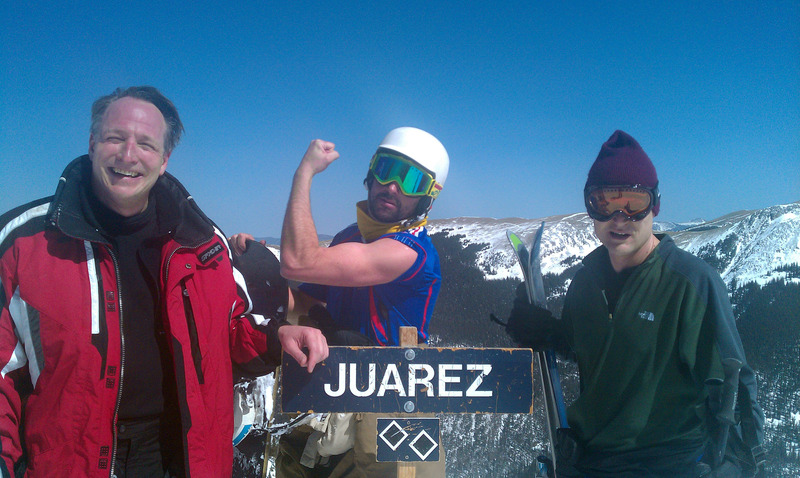 Brian Wohletz, Dave Washburn, Brady Nilsen standing on the Juarez ridge at Taos. 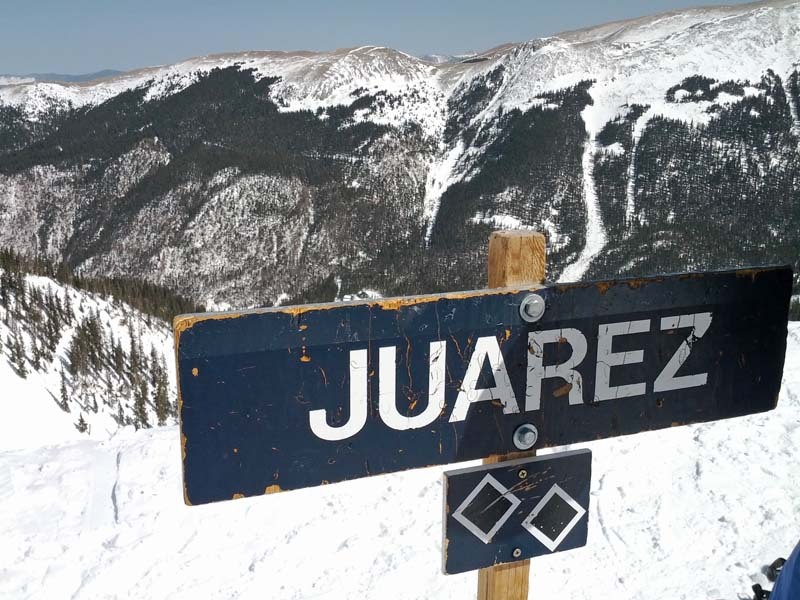 A close up of the Juarez double black diamond sign, a hike above the ski area at Taos. Picture by Karl. 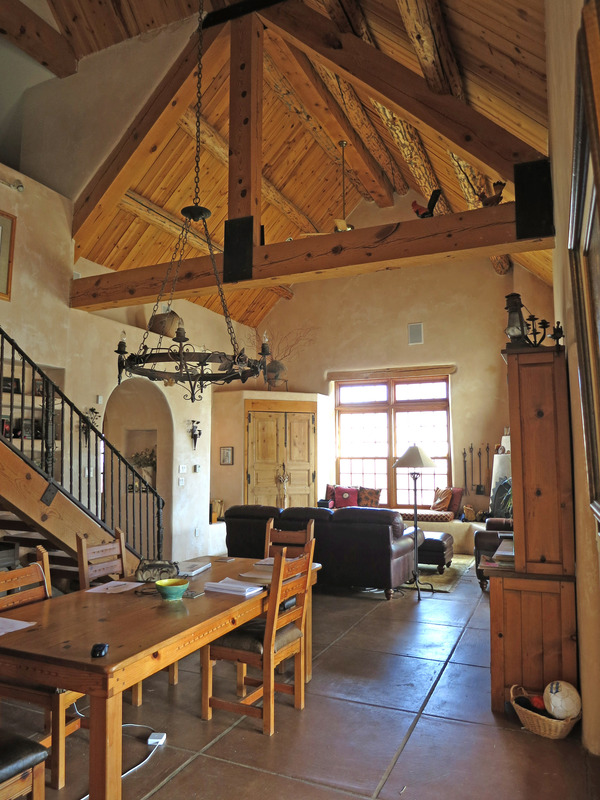 A picture of the house we rented, this is at 120 Manzanares St, Taos, New Mexico. It's nice, very south western knotty pine (as you can see), hot tub, sauna, 3 or 5 bedrooms depending on how you count them. 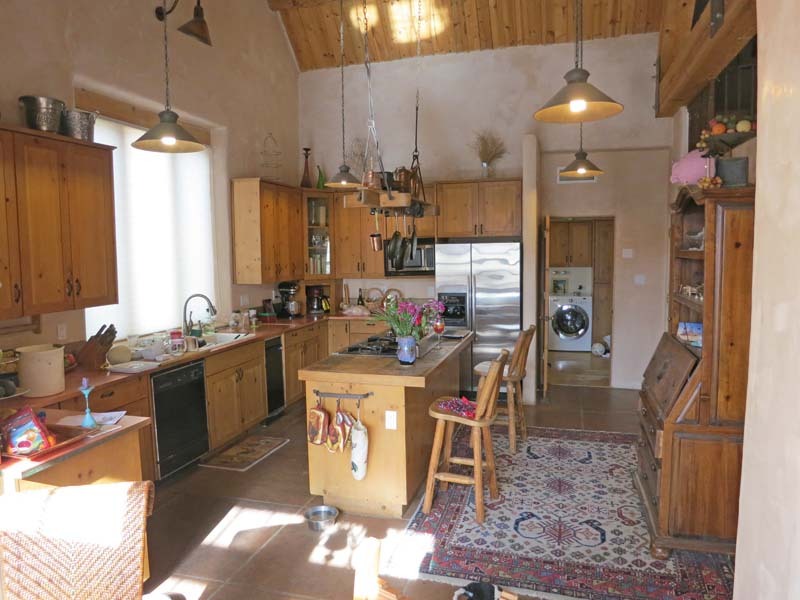 That wooden looking ceiling is a loft with a few beds. The living room. That's Karl leaning over, shattered by the Chow virus. The drive on the way back to Albuquerque in Slayer (our SUV). We at at "Slate Street Cafe" before most people got on an airplane home. I stayed one extra day at my brother's house. 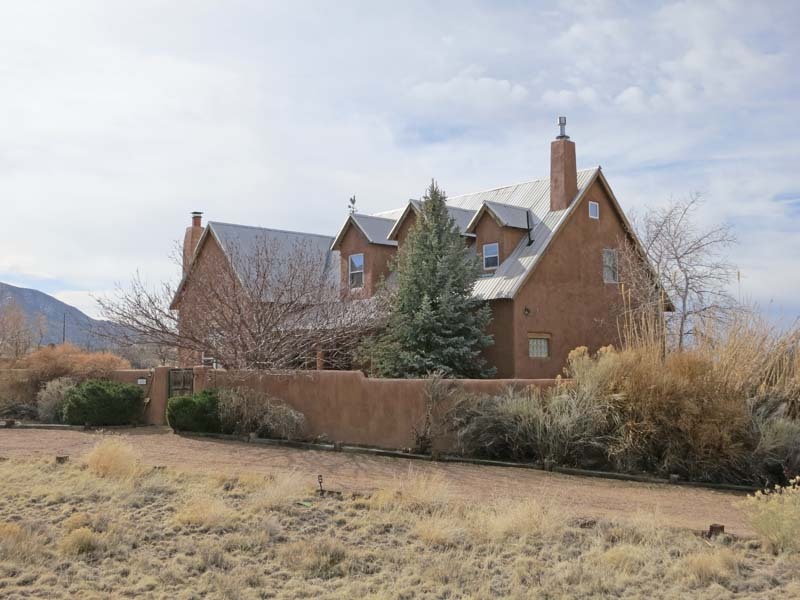 My brother's house in Albuquerque, New Mexico. He calls it "the barn". My niece Ari doing her math homework in the living room. 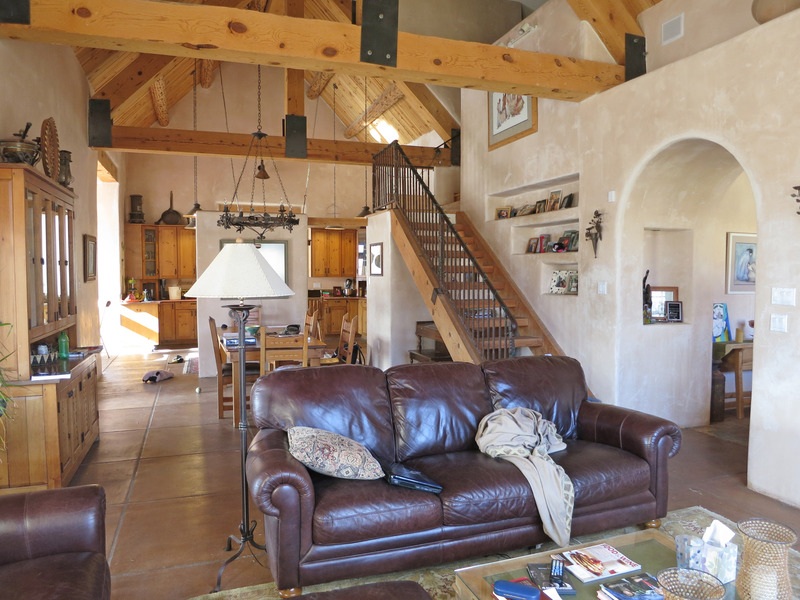 This is the "great room" in the barn. That's it, I flew home the next day. This is not for you! Stop reading! I'm old, I forget things. glasses & case for glasses?